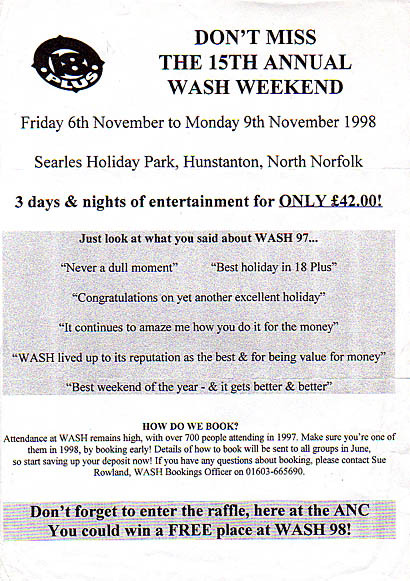 It’s strange to look back at some of the daytime entertainment at WASH and see how much has changed… for instance in the very early days there was a competition called the ‘WASH Challenge Shield’, which was a sort of ‘It’s A Knockout’ competition that took place around and in the outdoor pool (- remember this was when WASH was mid October, you wouldn’t want to be breaking the ice on the outdoor pool in the middle of November !) Then for years and years and years there was an activity called “Build Your Own Rocket” I never did do it, but I always imagine it was a ‘Blue Peter’ cardboard tube and sticky tape affair around a proprietory solid fuel rocket motor… I certainly never saw any Saturn V’s heading off for the moon from the back field at Searles. 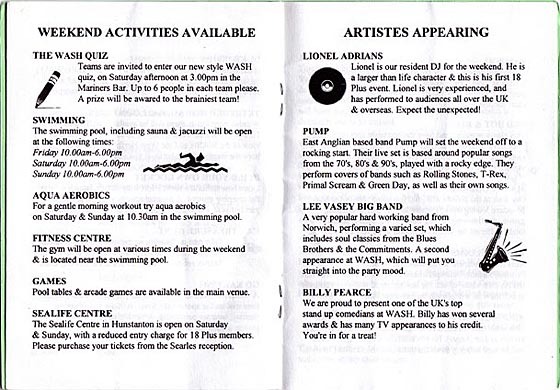 One of the most popular daytime events of later years has been the ‘WASH Quiz’ 1998 was the inaugural year of this event, and I am sure some of the teams have remained the same ever since, certainly the names ’10CC’ and ‘Sally Gunnell’s Love Tunnel’ seem to have been used every year. 1 WHAT DOES WASH STAND FOR ? Weekend At Sunny Hunstanton. 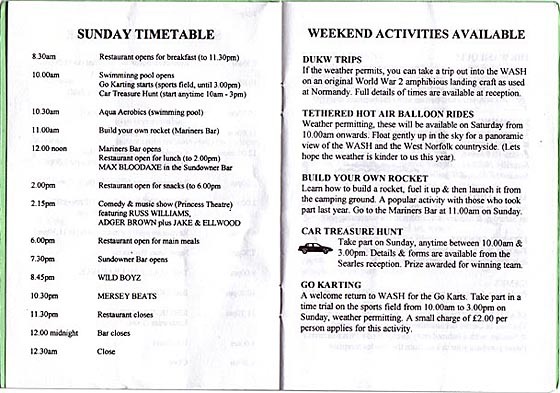 It is the biggest holiday in 18 Plus and is held at Searles Holiday Park, Hunstanton, North Norfolk, every year. This year it is being held from Friday 6th to Monday 9th November. 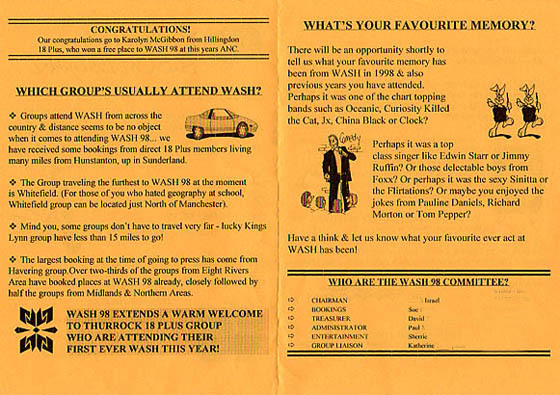 2 HOW MANY PEOPLE GO TO WASH ? 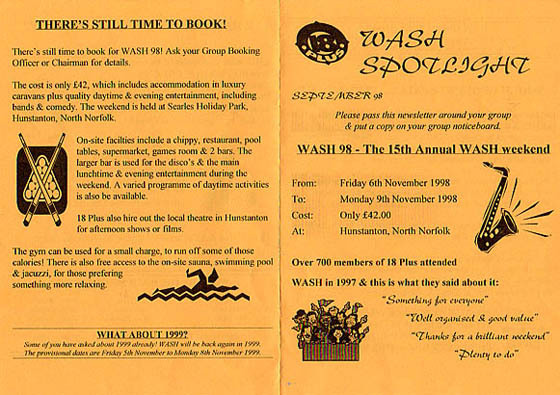 Over 700 people have attended WASH in the last few years and bookings received so far this year indicate that 1998 will be no exception. 3 HOW MUCH DOES IT COST ? 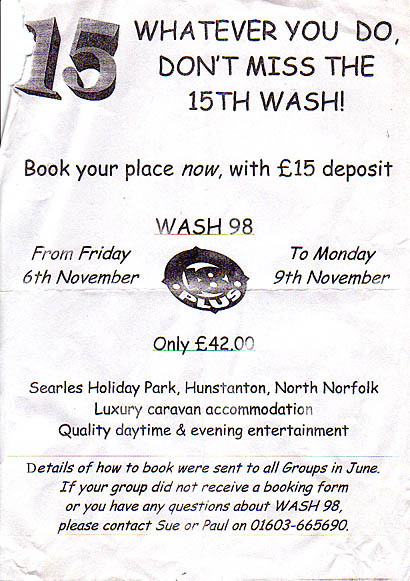 WASH 98 costs £42.00 but a £15.00 deposit will reserve your place. This price covers your accommodation in luxury caravans, plus use of most site facilities and quality daytime / evening entertainment. 4 ISN’T NORFOLK A LONG WAY TO GO ? Groups come to WASH from all over the country. For instance last year, members attended from places as far apart as Bristol, Marlow, Northwich, Sunderland, Doncaster and Southampton. 5 WHAT SORT OF ENTERTAINMENT AND ACTIVITIES CAN I EXPECT ? The WASH committee always endeavour to put on a wide variety of entertainment. 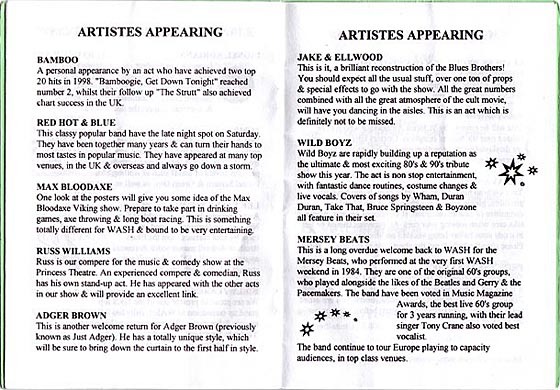 Recent years have seen comedy acts, hypnotists, chart acts such as JX and Clock, Voulez-Vous (an Abba cover band), land rover driving, line dancing, aqua aerobics, karaoke and even build your own rocket workshops ! You can also use the onsite swimming pool, sauna and jacuzzi for free. 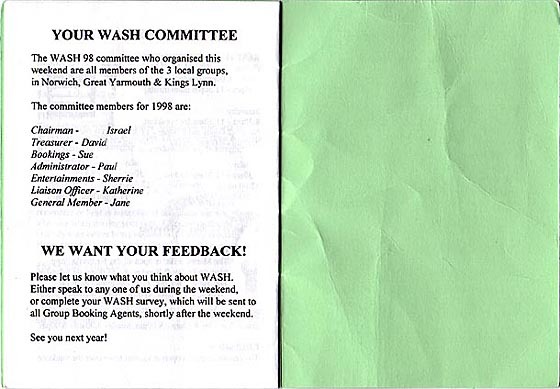 If you want to know more, why not speak to someone from your Group or Area who has attended WASH before. 6 HOW DO I BOOK ? Speak to your WASH booking officer. If you don’t have one then speak to your Group Chairman to get more details. 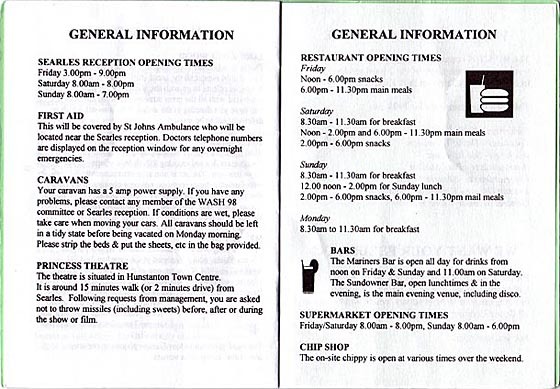 If you have any questions at all about WASH or how to book then Paul and Sue from the WASH 98 committee can both be contacted by phone. 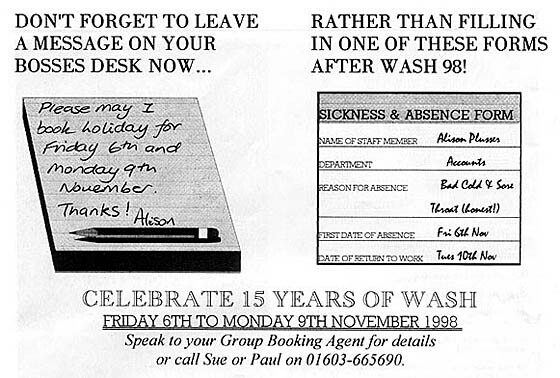 I always look forward to my weekend at WASH and the next one never comes along quickly enough. This was my sixth time at Hunstanton and I still enjoyed it tremendously. Clare and I took a leisurely cruise to Hunstanton and then had our normal search for our allocated caravan which was really lovely. Log effect electric fire, microwave, heating in the bedrooms and even a toaster which sometimes had a mind of its own. First it came out as bread and then on the second attempt it was burnt but my peanut butter covered it up well. 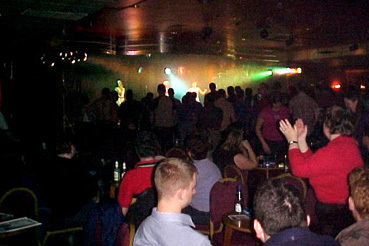 I had a great time on Friday night at the disco which included a few local bands. I spent half the evening catching up on lost time talking to people I hadn’t seen for a while. I would ask Clare if she wanted a drink and half an hour later I would return (Clare knows me by now !) I had a late night that night (or early morning) as I went caravan visiting. I didn’t quite make the Aqua Aerobics but Clare and Katie were in there splashing around. We were all impressed with Peter’s gourmet cooking with fresh vegetables, sausages, etc. but I must say he needs a bit of training on the washing up ! I just had trusty fish and chips one night. We all went out for a birthday meal for Emilia which was lovely apart from an overload of prawn cocktails being delivered to our table. This was because they weren’t crossing them off their list of things to make next. Then it was the turn of the garlic bread but without the cheese on top. It was really funny – we couldn’t believe it. We went to the venue afterwards for some dancing and bands then went back to a caravan taking my unfinished bottle of Woody’s with me. We went for our usual karaoke trip to the venue on Saturday afternoon where I found a partner to perform a duet with. But I was upset that even I alone didn’t get on the stage. Lucy from Watford 18 Plus was a bit luckier though and sung “Hot Stuff”. I struggled out of bed on Sunday after another late night and watched Eastenders (yes it’s true) before walking along the sea front to the comedy show. The show was OK except for the usual avalanche of falling sweets from above. We ventured back afterwards for the sad final night of WASH but we did have an enjoyable time dancing and watching a few bands. One was called ‘WildBoyz’ and I thought they were quite good. Next morning I didn’t break my tradition of being last out of the caravan due to a few hold-ups such as returning some cups that had ventured out of another caravan and Lucy turning up to say her goodbyes. There goes another excellent weekend although we did meet a fair amount of 18 Plussers in the Little Chef on the way home. 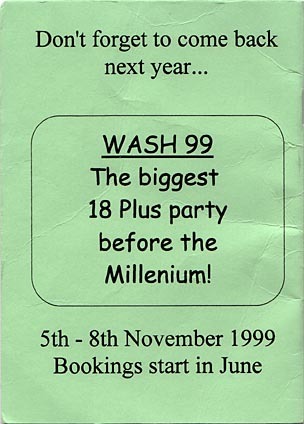 Roll on WASH 99 ! 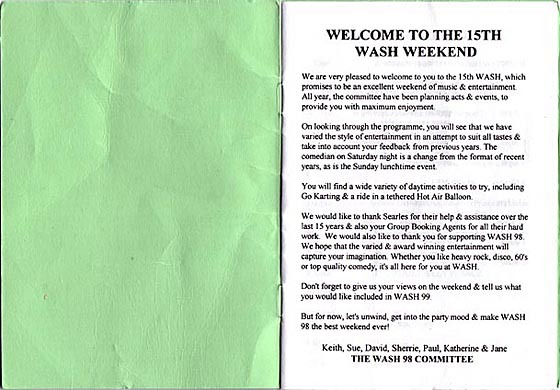 As an 18 Plus new boy I was asked to write what I thought of my first WASH weekend. This will be fairly difficult given that I was pretty much blotto the entire time, but here goes. I hope my impression isn’t so unique but I’ve found out something of what 18 Plus is like. The long and lonely roads of Norfolk came eventually to an end and out of a cold and dark Friday evening we arrived to suddenly encounter a hall of partying hundreds and life in East Anglia after all. These were our fellow campers for the weekend, well mingled and pretty much blotto. As we walked in they were cheering the just departed band called “Pump”. Apparently there wasn’t an error in the programme and we hadn’t just missed a performance of Jarvis Cocker and the group from Sheffield. I must stress that drinking is not compulsory for attendance at WASH but it did seem popular. Over the following two days I heard good songs ruined and brain teasers galore, tasted too hot food with 19 others, and saw top 20 hits performed in underwear. Also, I witnessed lawn mower stunts and shunts, Vietnam War machines and semi-famous faces bombarded by sweets. Was it real or all booze-induced hallucination ? The answer is both but refers to: lunchtime karaoke, the WASH quiz, a mass visit to the local curry house, the pop group “Bamboo”, enthusiastic go-karting, amphibious landing craft and a comedy and music show besieged by hecklers and an audience of confectionery throwers. 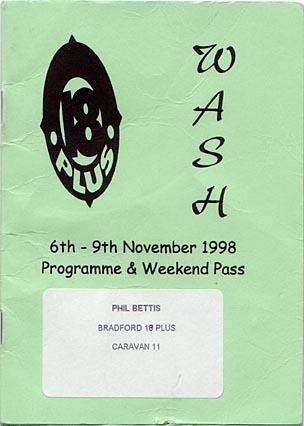 Good times were generally had by all and I would say it was thoroughly good value for money. The event was also well organised. It’s an impressive venue with good and modern facilities although Hunstanton itself is not a riveting town. We stayed in a decent and fairly luxurious caravan with no complaints. The weather was not as shocking as it could have been. The only worry was that our time went quickly, but I believe this is a good sign. To fully enjoy the weekend you need total stamina. As a survivor I’m impressed about how much of it all I remember. The Sunday comedy show in the Princess Theatre was as usual well attended with the upper balcony full and much of the downstairs full as well. Russ Williams and Adger Brown both went down well Adger particularly went down well even though some of his material he was still using from the last time he played WASH in 1994. Jake & Elwoods Blues Brothers show however was not well received at all, rather than getting people up and dancing in the aisles they got people up and walking out. 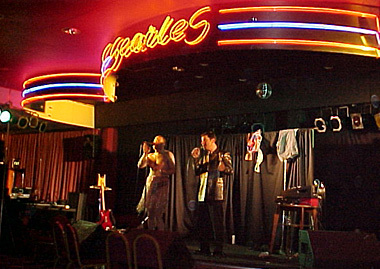 A couple of guys wearing suits and dark glasses doing bad jokes and middling karaoke to Blues Brothers songs may go down well at nights in bars on the club circuit, but on Sunday afternoon in the Princess Theatre for an audience of tired Plussers who are used to quality entertainment they just were not good enough. The balcony was full for the first part of the comedy show, by the time Jake & Elwood had finished there were only 10 people other than me left upstairs, and the downstairs was fairly empty as well. An American landing craft of Vietnam vintage, reckoned to be the largest amphibious vehicle in commercial use anywhere in the world and reputedly costing $1,000,000 dollars to build. 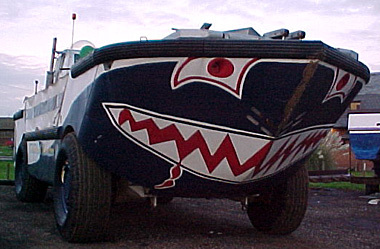 Back in the early days of WASH the trips out to sea were done in a second world war DUKW. It was a bright sunny day when the Whitefield convoy set off for WASH some were biting our nails in case we didn’t get there – namely me and Elaine – (Elaines car had broken down in a big way, she only got it back Friday dinnertime). After an uneventful journey (all the hunky hitchikers had mysteriously disappeared !). We arrived just in time for Pizza ! 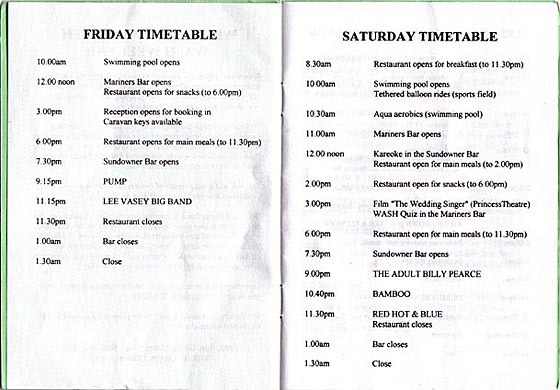 It was then time for ‘Pump’, (my band of the weekend – anybody who knows me will know why! ), and another band, who were very good but not really my thing. Saturday was spent (well five minutes of it, as thats how long it took) walking through Hunstanton. Saturday night – highlight for me being Billy Pearce who had me laughing so much I nearly fell off my chair; (and alcohol had nothing to do with it! ) later on came “Red Hot and Blue” – another very enjoyable band. Monday morning we very sadly set off for home.